Radical Islam once more strikes Pakistan because Sunni Islamic fanatics are intent on installing a radical Sunni Islamic monoculture on the people of this nation. However, in Pakistan you have many diverse Muslim communities, for example Shia Muslims and Ahmadiyya Muslims, and of course you will have many sub-divisions within each branch because of ethnicity or certain factors and you will have many differences within Sunni Islam. Also, you have other faith groups and this applies to Christianity, Hinduism, and Sikhism. Despite this, the men of hatred desire to enforce their version of Islam on the entire population, Therefore, Pakistan is being torn apart by the “year zero” mentality of radical Sunni Islam and this can be seen by the recent slaughter in Lahore. This latest massacre is a continuation of Sunni Islamic hatred which slaughters Christians in Nigeria, kills Buddhists in southern Thailand, and spews it hatred towards all irrespective of the continent you reside in. It is part of the same evil force which did September 11th and which stones women to death for adultery in Somalia and which kills converts to Christianity in the same land. Radical Sunni Islamists are at war against humanity and diversity, just like the Islamic past and it is clear that enemies are everywhere. Therefore, in modern times radical Islamists are killing or persecuting Buddhists (southern Thailand and Bangladesh); killing and persecuting Christians (Egypt, Iraq, Nigeria, Pakistan, Somalia, and other nations); slaughtering and victimizing minorities like the Shabaks, Mandaeans, and Yazidis in Iraq; and Islamists in Pakistan are also persecuting Hindus and Sikhs. Therefore, the latest terrorist attack against Ahmadiyya Muslims in Pakistan is a mere continuation of this hatred and the ongoing monoculture which is behind radical Sunni Islam. Given this, Ahmadiyya Muslims, Christians, Shia Muslims, Hindus, and Sikhs, are all targets of this violent ideology and they are being persecuted in the name of Islam in Pakistan. Of course certain Western leaders desire to appease radical Islam and this certainly applies to the current leader of America, President Obama. After all, President Obama bent over backwards in Egypt in order to appease Islam and he clearly did not care about the ongoing victimization and persecution of Coptic Christians who are suffering so much in this land. Therefore, while the latest slaughter of Ahmadiyya Muslims in Lahore, Pakistan, is shocking and a crime against humanity; it is sadly predictable and for Sunni Islamists their hatred is inspired by the teachings of Mohammed and to them they deem all others to be infidels. The death toll at the moment is at least 70 people but it may rise and clearly Sunni Islamists do not care if they slaughter innocents in a mosque. To them, it is their sacred duty to kill in the name of Allah and if this applies to killing people in a Christian church, a Muslim mosque, a Buddhist temple, or wherever, then it does not concern them. 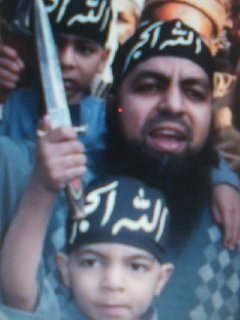 However, will this latest massacre wake the world up to this evil ideology or will it be appeasement time once more? I know what I wish but given the current state of affairs then words like “Islamic terrorism” will wound leaders like Obama and writers like Karen Armstrong. Then it is clear that Islamists are killing in the name of Islam and in the name of crushing all forms of diversity within Islam or the non-Muslim world. Therefore, this hatred which is inspired by the Koran and the Hadiths will continue to butcher and kill innocents irrespective of your religion or if you have no religion. However, when will the so-called elites wake up to this global menace?